Our humble 5×4 Project has developed more global momentum this week after being presented at the World Sustainability Conference (WSC) in Barcelona. A case study on the project by R.H. Crawford and T. Hollingsbee was presented, which assessed the Embodied Energy of our building, and how we have optimised its energy performance. The Embodied Energy is the consumption of energy over the lifespan of the building, including construction, materials manufacturing, and of course recurring energy costs – such as appliances etc. The case study and resulting presentation looked at measures that the 5×4 project had taken to substantially lower the embodied energy of the building, and using environmentally friendly materials and appliances, building consciously for minimum energy consumption, and finally generating green electricity through solar power to cover the remaining energy costs. Click here to download the complete paper, or visit the WSC website for more about their sustainable ambitions and their next conference in 2017. The electricity used in the build of 5×4 will be supplied by Diamond Energy and will be 100% GreenPower, sourced from GreenPower-accredited biogas generation plants at Shepparton and Tatura. By purchasing GreenPower, households and businesses commit their electricity providers to purchasing the equivalent amount of electricity from accredited renewable energy generators, helping build renewable energy infrastructure and sources. Please help us tip the scales in favour of renewable energy! 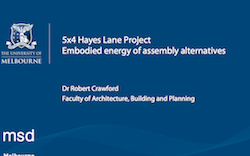 The Project Team met today to discuss the Embodied Energy of the 5×4 Hayes Lane Project. The total embodied energy of the Project will be measured and assessed by Dr Robert Crawford. In the next few weeks, the Project’s Architect and Engineers will work together to come up with a detailed material analysis, with details about their quantum of area and volumes to be used in the Project. This will then assist Dr Robert Crawford in assessing the embodied energy, allowing for us to come up with the most ecologically friendly product and material solutions for the build.